It’s been nearly four decades since Gregory Benford’s classic, multiple award-winning Timescape, which was lauded as much for its convincing portrayal of working scientists as for its ingenious notion of tachyonic cross-time communication. 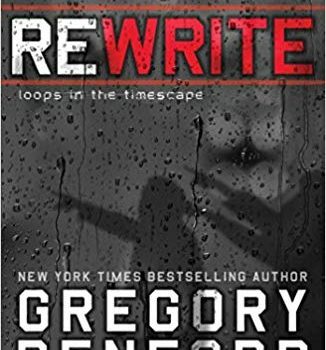 Benford describes Rewrite as a “conceptual sequel” to that novel, but for the most part the scientists in it are walk-on celeb­rities – including Einstein, Hugh Everett, and even Benford himself (very thinly disguised as his twin brother James) – rather than working drudges struggling for promotions and publica­tion, and maybe saving the world from ecological doom. That’s only one of many contrasts between the two novels. Timescape was as rigorous as Benford could make it in terms of the physics of communication with the past (the warning signals from 1998 had to be beamed toward the astronomical location of Earth in 1962, some­thing nearly all time travel tales conveniently overlook), but Rewrite opens with an event that might as well be magical: historian Charlie Mo­ment is killed in an auto accident in 2000 and wakes up in his own 16-year-old body back home in 1968. Timescape was a deeply character-driven work which pioneered a variety of liter­ary hard SF (later taken up by Paul McAuley, Alastair Reynolds, and others) and ended with a rather somber, bleak future in a dying timeline. 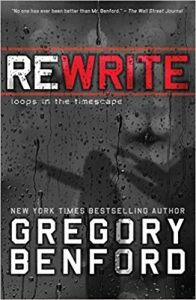 Rewrite, on the other hand, may be the most playful novel Benford has written in years, one which asks, among other things, what Back to the Future might have been like if Robert A. Heinlein and Albert Einstein had been involved in its production. Then the novel effectively breaks in half. While climbing the Hollywood ladder, Charlie has also been trying to find a rational explanation for what’s happened to him, which leads him to Hugh Everett’s many-worlds interpretation of quantum mechanics and even to a meeting with Everett himself. Suspecting there may be others like himself, he hires a private eye, who suggests he read Timescape (leading to his meeting the author, “James Benford”) and who later leaves a cryptic phone message that eventually leads him to a mysterious address in Manhattan. Here he learns of a secret society of “reincarnates,” some of whom have lived for centuries, some of whom can even switch bodies, and some of whom are Robert and Ginny Heinlein, Albert Einstein, and Casanova, reimagined here as a rather louche sort of time lord. Now the tale takes on aspects of both stories like Poul Anderson’s Time Patrol series or Asimov’s The End of Eternity as well as Fortean notions of secret masters, as various factions compete to manipulate the timelines. This leads to some pretty satisfying adventure sequences involving mysterious assassins and Heinlein act­ing out his own competent-man scenarios, and to Charlie reconsidering the possibilities of his own role in this expanded universe. The result is a good deal of fun mixed with some more up-to-date speculations on quantum entanglement – the sense in which the novel is really a “conceptual sequel” to Timescape – as well as elements of the kinetic thrillers Benford has been experimenting with for some years now, but it’s not quite a return to the deeply character driven, almost meditative concern with the politics, philosophy, and impact of academic science of the original Timescape. It is very interesting how different the same story trope is treated in US and in Easter Europe. Here the protagonist makes a career in Hollywood, get rick and goes after women, In the modern Russian SF there is a sub-genre called попаданская фантастiка (fallen-in SF) which strictly speaking is AltHistory, where the protagonist goes back to the past and tries to “upgrade” their country. 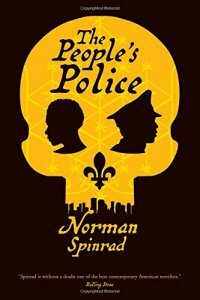 In a large fraction of such books the character appears just before the WWII and tries to change the course of the war. The running joke is about a hero who goes to Stalin with a notebook full of drawings of future weapons. I have heard about a Polish movie along the same lines (minus Stalin). My country has its own share too. The closest Western analog that I know of to all this is Guns for the South by Harry Turtledove. I appreciate your dissection and analysis of this as a subgenre of SF that seems to be influenced by the country of origin. I think you are on to something. The reasons for these differences are possibly a reaction to the culture of the authors. With the Mythos of Success dependent on the overall culture versus a rational desire. But in any case, a winning analysis. Thank you. I had the great good fortune to listen to Bradford on The Geeks Guide to the Galaxy. He does a good job of explaining his thought process of the physics behind the book’s premise. I might suggest listening to it before reading the book as it works as more of a primer to the work and shows a man who has seemingly known most of the scientific fiction writers he embeds into this book. He also did the Hollywood thing until he burned out. To quote our favorite Vulcan: Fascinating.